I last updated you on how it was going using the Spring TMS (sTMS) device for migraine in October (2015) and promised another update in three months. For those of you who are reading about the sTMS for the first time, it's a device that delivers a magnetic pulse to the back of the head. It's FDA-approved for the acute treatment of migraine with aura, but it's also being used off-label for the acute treatment of migraine without aura and for migraine prevention. When a migraine is in progress, the magnetic pulse is intended to disrupt cortical spreading depression (a wave of irregular electrical activity that sweeps the brain when a migraine trigger is encountered, leading to the migraine attack and its symptoms) thus aborting the migraine and stopping the symptoms. When used twice a day for prevention, the magnetic pulses are intended to keep cortical spreading depression from starting, even when we encounter migraine triggers. preventively, twice a day every day. The chart below shows, for each month, how many migraines I had, how many were successfully aborted by the sTMS, how many required a triptan, and the percentages for sTMS success. When I reported on the sTMS in October, it appeared that it was working pretty well acutely and might be helping reduce the frequency of my migraines as well. It now appears obvious that it is helping with migraine prevention as well as acute treatment. I can come to that conclusion because the addition of the sTMS is the only addition to my treatment. Dr. Watson and I have also been doing Botox injections every 12 weeks for migraine prevention. For a couple of years, my migraines followed the same pattern - at the 10-week mark, as the Botox was starting to wear off, my migraine frequency increased. This is pretty common. The first time I went for my Botox treatment after starting to use the Spring TMS, we noted that I hadn't had the usual increase in migraine frequency leading up to the Botox treatment. Neither of us were prepared to credit the sTMS for it though. 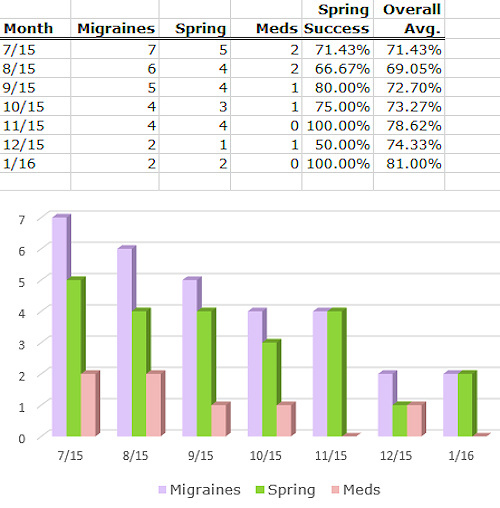 Because of scheduling issues and my attending a conference in November, my treatment on December 1 fell 14.5 weeks after my previous treatment, and once again, I had no increase in migraine frequency before the treatment. We now think it's quite possible that using the sTMS twice a day for prevention may be responsible for this. We're also wondering if the Spring TMS device is going to be effective enough for prevention that we might be able to discontinue the Botox treatments. We don't want to just discontinue the Botox only to find that I really need it because sometimes, treatments don't work again after being discontinued. So, we've scheduled my next Botox treatment for 16 weeks from the last one. We'll see what happens! Availability: For some time after FDA approval, the sTMS was available only through academic headache centers. This was because it was a new device, developed and manufactured by a small company (eNeura). Once the device was approved, it took time to get production up to speed. The availability is no longer limited to academic centers, and more migraine specialists can now prescribe it. If you want to see which doctors near you can prescribe the Spring TMS, you can email eNeura (the company that makes the device). Doctors who are interested in prescribing the device can also email that address. Insurance: As with many new treatments, the insurance issue is still up in the air. eNeura does not bill insurance companies, but we can submit our invoice for reimbursement. I'm still working to try to get my insurance company to reimburse me. So far, they seem to be avoiding the issue and haven't replied to pay or deny. I'm going to resubmit my invoices via certified mail, hoping that their having to sign for the mail will result in a response. I can make an excellent case for them covering the sTMS. It's safer for me since it has no cardiac warnings as triptans do. Also, at this point, it's already saving them money since I'm able to go longer between Botox treatments. As with any migraine treatment, the Spring TMS isn't going to work for everyone. It could work well for you for both acute use and prevention, for acute use only, for prevention only, or not at all. The only way to know if it will work for you is to try it. Also as with other migraine treatments, it's important to use it as directed and not to give up on it too soon. I'm seeing great success with the sTMS and hope that anyone else who tries it will have good results too.